Few Philadelphia blues fans were aware that Magic Slim was in Philadelphia in February, in the intensive care unit at Thomas Jefferson University Hospital, where he died on February 20. The great bluesman had been hospitalized in January when he arrived in Phoenixville to play a gig with Johnny Winter, and was transferred to Jefferson as his condition worsened. 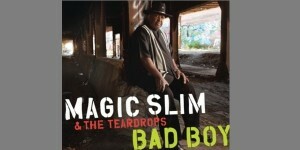 Magic Slim was born Morris Holt in Torrence, Mississippi in 1937. He grew up on a farm, and learned piano before guitar. 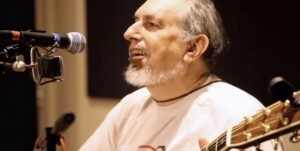 After losing most of a finger in an accident with farm equipment, he switched to guitar. Holt got the name Magic Slim from the famed Magic Sam, whom he met when he went to Chicago in the 1950s. Slim’s rise to prominence was slow and the result of long, hard, deliberate work. He was not well regarded as a player in the 1950s, and returned to Mississippi from Chicago for a while, where he recruited his brother Nick Holt to play bass. Later he established his band, The Teardrops. In the 1960s and 1970s he played in very small clubs in Chicago and released a couple of singles, finally coming out with a full album on a French label, MCM Records in 1977. He also recorded for the Austrian Wolf label. In the 1980s, Slim finally became better known here in the U. S., and had albums released on the Alligator and Rooster Blues labels. Later he recorded for Delmark and also for many years for Blind Pig. His brother Nick remained in the band until his death, and his son Shawn “Lil Slim” Holt also played with him. Slim was a tireless performer, playing at countless festivals and clubs, and recording about three dozen albums over the past three decades. Slim had a crowd-pleasing performance style and a huge repertoire of blues songs, both well-known and not. He never ran out of material or energy. His obvious joy at performing was no doubt a big part of the reason for his long-standing popularity. In 1994 he quit Chicago in favor of Lincoln, Nebraska, reportedly because he felt Chicago was too dangerous a place for his son to grow up. He regularly performed at The Zoo Bar in Lincoln and was recorded live there several times. Slim performed at The Pocono Blues Festival in three different years, and at The Pennsylvania Blues Festival in 2011. His most recent album is called “Bad Boy” and it includes a high-spirited version of J. B. Lenoir’s song “How Much More Long.” Magic Slim was a familiar figure for blues fans in this area, a testament to his extensive touring, frequent gigs here, and always highly enjoyable shows. 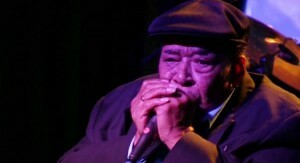 Check out these performances by Magic Slim at the Pennsylvania Blues Festival in 2011.